When you’re planning an event, one of the first decisions you must make is the location. You want to ensure that your guests not only enjoy themselves, but also have access to everything they might need. Instead of combing through pages and pages of potential event spaces, you could save yourself some time and rent a tent. 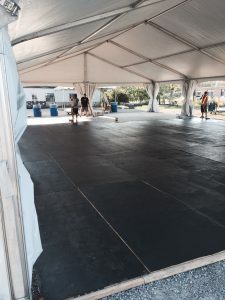 While you may be thinking that a tent rental couldn’t possibly supply all of the amenities you will need to host a memorable event, think again. Varsity Tents offers accessories for everything you could imagine. From climate control to lighting, we have you set! Perhaps the thing that will worry you the most is the uncertainty of the weather on the day of your event. Tents are the perfect way to simultaneously incorporate indoor and outdoor features into your party. If there are any unfortunate weather conditions, like rain, you and your guests will be comfortable inside your tent rental. If your event is in the summer, excessive heat could put a real damper on the mood of your party. Fortunately, you have the availability to add air conditioning to your tent. In contrast, if you are planning an event in the winter months, there are different types of portable heaters that can be used for the comfort of your guests. Something that can be stressful in event planning is ensuring there is enough seating for your guests. This isn’t simply making sure every guest has a chair, but considering extra seating options like couches, or lounge areas. If you are renting a tent for a wedding, there are also tables available for rent. If your event or party will have some sort of entertainment, you can look into stage settings. Stages can be used for music performances, or other forms of live entertainment. There are also risers available to highlight any displays at your event. If you are indeed having live performers at your event, your tent can come with all the related accessories. We offer stage and theatrical lighting, along with all of the audio-visual equipment you could ever need. You can add on accessories like turntables, amplifiers, mixers, and projectors. There are some seemingly small accessories that make a huge impact on your event. A commonly overlooked part of an event, is accumulated trash. Supplying your guests with an adequate number of trash and recycling cans not only makes things easier for your guests, but for your cleanup as well. You may be wondering if all of these amenities are available for you, and they are! All tents have the availability to be equipped with a generator. This means that you can have power even in remote locations. There are so many things to check off when planning an event. You have to ensure that your guests are comfortable, and everything runs smoothly. No matter what event you are hosting, all of your setups can be done with one simple step-renting a tent!